The minister’s discretionary fund is used to assist members and friends of the congregation and members of the larger community in meeting their basic living needs (such as shelter, food, utilities, medical) and other exigencies (such as transportation, fees). Funds may be given as a loan or a gift, depending upon the person’s ability and the circumstances. The minister has discretionary and confidential use of these funds within the proposed guidelines. How is this fund different from pastoral care? Pastoral care funds are used to welcome new babies, comfort those who mourn and tend those who are ill, and celebrate other rites of passage. How are community needs met in our area? The Middlebury Area Clergy Association has an agreement with HOPE to filter individual requests from the community. Therefore, the churches either give money when it is requested by HOPE or give an annual amount to HOPE. That does not preclude any church from giving to any individual or any other organization, but it stems the requests to individual churches. How do I parcel out the funds? I try to use about half of the funds for each half of the year, so that I keep a reserve. Members and friends rarely come to me to ask, but I discover that a difficulty exists in a conversation – and I remind them that this fund exists. When it is a member or friend, or an individual, I ask the treasurer to make the check out to me, and I either given them a personal check or cash. If there is a better way to maintain anonymity and keep our accounts, I am open to a different process. The churches also give each year to the Clergy Rent Fund which provides the deposit and first month’s rent for renters. That is a loan fund, but is often not repaid. Each church is asked to give $250 a year. This amount should be a line item in our budget. We give part of our Christmas Collection to this fund. From Rev. 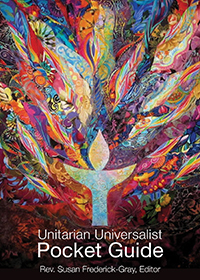 Johanna Nichols, with input and approval from UUA district.